World Cup 2018 have started in Russia. Now everybody is stuck to the screens following their favorite national teams and hoping to win some money after betting. It seems like all the problems in the world have disappeared so that all of us can enjoy the game. After all it should be the game that unites. But behind the fireworks and rich football players there are things that are hidden from the eyes of audience. Those things pop up from time to time in oppositional news in Russia rarely making it to the world arena. And there is a lot happening to the people while the rest of the world enjoys the show. 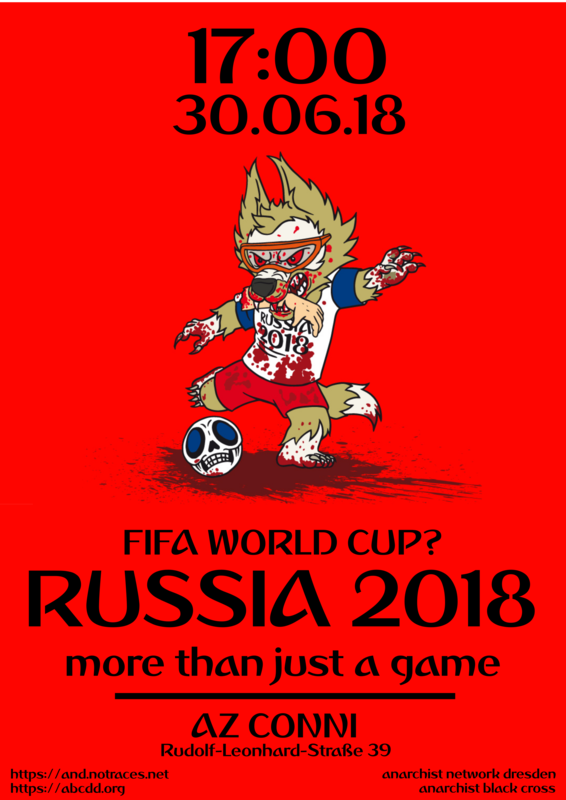 World cup 2018 is celebrated in the country that belongs to Putin and his surrounding. And they managed to achieve little protest during those days not with social programs and support of the society rather with smashing any opposition that can appear in any form. Or repress those that are not involved in politics just to make sure that nothing happens. This world cup is happening in the country whose leader is becoming more and more appealing to the westerners who look for the strong hand to rule them all. However little is known in Europe of the price that russian society is paying for last 18 years of putin’s rule. One activist from Russia will visit us this evening to talk about the situation that was happening before and happens now during the cup in the country. Also we will be collecting money for repressed anarchist and antifascists in Russia that evening, so withdraw your bets and donate those money to those who need them most right now. Presentation will be in English with possibility for German translation.